(Chinese mustard; Indian mustard) A splash in the salad bowl and in the garden! 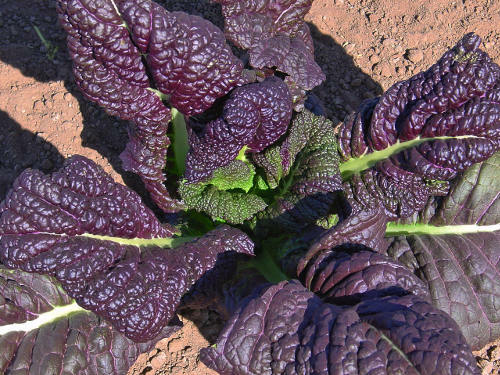 Brilliant maroon leaves with light green midribs are both delicious and strikingly ornamental. Spicy leaves are excellent in mixed salads or alone, and they are delicious steamed and tossed with sesame oil and soy sauce or stir fried with ginger and bok choy and chicken. Sow in early spring. Can even be grown in containers. Cold tolerant. 45 days.